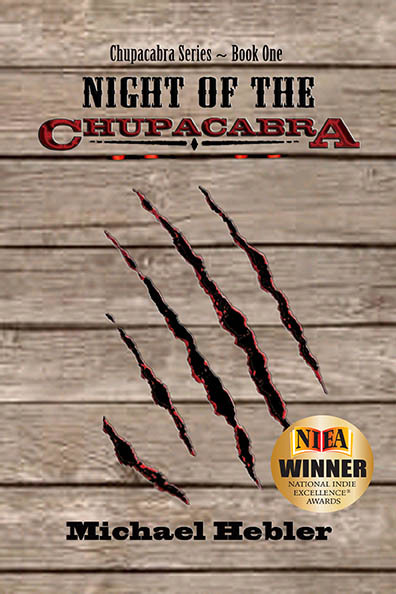 The National Indie Excellence Awards has credited "Night of the Chupacabra" by Michael Hebler as Best Novel in the category of Horror for 2014. Night of the Chupacabra Synopsis: There is a creature that lurks in the vast open deserts of the west. It can only survive on blood and, although it prefers to prey on the weak and young, it will slaughter anyone or anything, once provoked. It is unnatural, deceptive, and difficult to kill. Word about the existence of this elusive beast has not spread since anyone who has crossed paths with it did not live long enough to tell of their account. In the Chupacabra Series, a vampire-like, cryptozoological creature (which literally translates to “goat-sucker”) takes a supporting role to a cast of memorable characters who struggle to survive while finding their place in developing America. Currently slated for six books, the Chupacabra Series echoes strong family themes and the sacrifices required for that nature of love; and while some characters do survive through multiple novels, each volume will host a different protagonist to lead the reader through its harrowing journey. “This year the expert team of publishing insiders who serve as judges of the NIEA, were challenged because of the quality of entries. I would have to say this was the fiercest competition we’ve seen. It’s a new day in publishing in 2014,” said Reid. Prior to becoming an award-winning author of his dark fiction Chupacabra Series, Michael was a full-time international film publicist who had worked on multiple titles for Walt Disney, Pixar, Lionsgate, Lakeshore Entertainment, Warner Bros., and Summit Entertainment. Born in the early 1970's in Los Angeles County to a salesman and a homemaker, Michael dreamed of following his passions for entertainment and storytelling by becoming an actor. It was while studying theatre arts at Orange Coast College in Costa Mesa, California, did he realize his penchant for stories were better suited on the page rather than the stage. However, creating tales with suspense, laughter, and heart is not Michael's only love. Hebler also enjoys volunteering in his local community for Meals on Wheels, as well as aid in the capture/spay/neuter/release feral program. To date, Michael's publications include “Night of the Chupacabra” and “Curse of the Chupacabra” (Books I & II of six in the Chupacabra Series) as well as his first publication, “The Night After Christmas”, a holiday picture book for believers of any age. In 2014, Hebler will release two additional titles: “Legend of the Chupacabra” (Chupacabra Series, #3) on July 29, and “The Ghost of Christmas Past,” a spiritual novella placing the Spirit in the center of its own afterlife, and life, while aiding a woman's complicated past, on October 7.